Our organization is backed by well-established infrastructure where we have implemented advanced production lines for manufacturing of the products with maximum perfection. Having spent so much time in this domain we procure raw materials from the most reliable and authentic vendors of the market because we believe in quality as a major area of focus. We also have a Research and Development department which conducts research with the help of modern instruments and tools to bring innovation in our products so that we can keep the pace with changing market trends. Under the adept leadership of Mr. Bhagat Patel, we have achieved a reputed position in the market. Under his guidance, we have been able to meet client expectations. His managerial and marketing skills have helped the company to attain a reputed position in the market and gather huge client base. 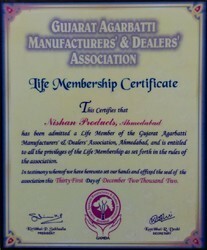 We are a Member and Promoter of Gujarat Agarbatti Manufacturers and Distributors Association. 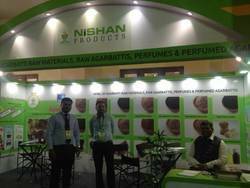 At Nishan Products, we provide international standard range of incense making machines and raw materials to our valuable patrons, in a zest to attain maximum client approval. Timely delivery of the offered range of raw materials is assured owing to our efficient transportation facility. Excellent packaging facilities ensure safe transportation of the offered range at the patrons’ end. By providing easy payment modes, we keep the budget constraint and convenience of our patrons in mind. Further our continuous improvement and innovative ideas for product development have led us to new heights in the area of client satisfaction and goodwill in the market. Backed and supported by a team of quality controllers, procurement agents, warehousing experts, administration personnel, skilled & semi-skilled professionals, production managers, sales & marketing executives and other supporting staff, we work to attain maximum client satisfaction. They are appointed by our mentor after assessing their skills, knowledge and experience on pre-defined selection parameters. Boasting on very congenial working environment, our employees cater to the precise needs of our valuable patrons in the most efficient manner. We are active sponsors of Agarbatti Expo.